Last night a new arrival to the middle kingdom asked me whether or not the water was safe to drink. “It’s safe as long as I boil it, right?” she said with a worrying tone. The answer is yes, for the short term. A thorough boiling of water is enough to kill the things that cause unpleasant stomach situations. For as long as Chinese people can remember, water has been boiled and served hot. There are a number of Traditional Chinese Medicine beliefs about the benefits of warm/hot water, including digestive aid and the curing of common ailments. In fact there are even accounts from the late 1800’s about how miserably sick the Irish were while building the railroads in the US due to drinking untreated water while the Chinese thrived with their boiling hot tea. Even my wealthier Chinese friends still rely heavily on boiled water and have their Aiyi (like a maid) prepare several large thermoses every day for their use. If you inspect the thermoses carefully though, you’ll notice that your Chinese friends never use the last few cups of water in them. This is because of the build up of metals and other minerals that result in a mixture which looks like somebody drained a snow globe. So boiling the water doesn’t necessarily mean that the water is free of contaminants, and that was in Beijing in the run up to the Olympics. More recent reports suggest that 190 million people in China drink water with “high levels of hazardous substances” and a total of 300 million drink “unclean water,” and given China’s lax measurement when it comes to air quality, it is probably best to assume those are conservative estimates. Further more, there are chemical spills throughout China at a fairly regular interval. I experienced one such event while living in Guangxi in 2008. A chemical factory located near the Longjiang river exploded, spilling unknown amounts of hazardous substances into the water supply. The plant was less than 20 miles away from where I lived, but news did not reach us until late that evening. Just after I finished playing an hour and a half of badminton, I was informed that I should avoid outdoor activity at all costs and that I should have stocked up on bottled water. While this might seem rare, just last month the exact same stretch of river was found to be highly contaminated by cadmium. China Daily quoted an expat from a nearby city who said that the public was not informed of the dangerous levels until two weeks after the problem was detected when hundreds of dead fish were discovered upstream. So for those of us staying in China long term, we’re better off sticking to bottled water from a trustworthy company. I emphasize the trustworthy aspect because my Chinese friends boil this water as well, just in case the company is filling the jugs with tap water. Update: Caixin Media has reported that up to 50% of China’s drinking water treatment plants may not be meeting the country’s standards. 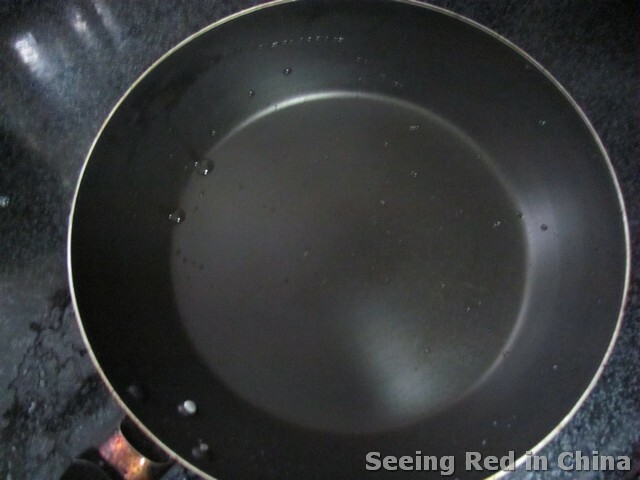 Just for fun I boiled down a pan of water to see what would be left. While highly unscientific, the results were unsettling. By T in Economy & Development, Environment on February 22, 2012 . Nasty stuff. But here, you can’t be sure that even the bottled water is anything different. I wonder what future historians will say about China destroying so much of its environment to produce stuff to sell to the US in return for IOUs denominated in US Dollars. Hmmm…channeling the spirit of Mao, Lao Why? I imagine the pitchers and replacement filter cartridges can be order fairly cheaply online. Come to think of it, it seems to me P&G has an office in Beijing and factories in Guang Zho… Perhaps Brita does as well. “Even my wealthier Chinese friends still rely heavily on boiled water and have their Aiyi (like a maid) prepare several large thermoses every day for their use.” I’m a little puzzled by this statement, Tom. Are you suggesting that younger or poorer people aren’t relying on boiled water anymore? I don’t now of anyone that doesn’t. Also, your boiling water experiment is a universal phenomena. 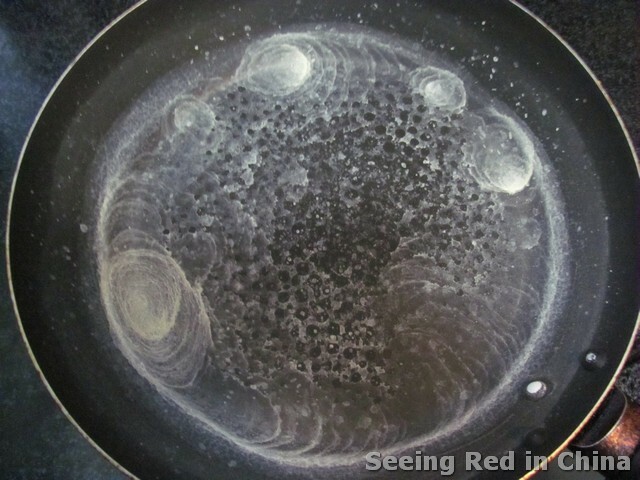 That’s what minerals in water do when you boil it. The sentence implies that even those who have the means to buy filtered water will boil it. 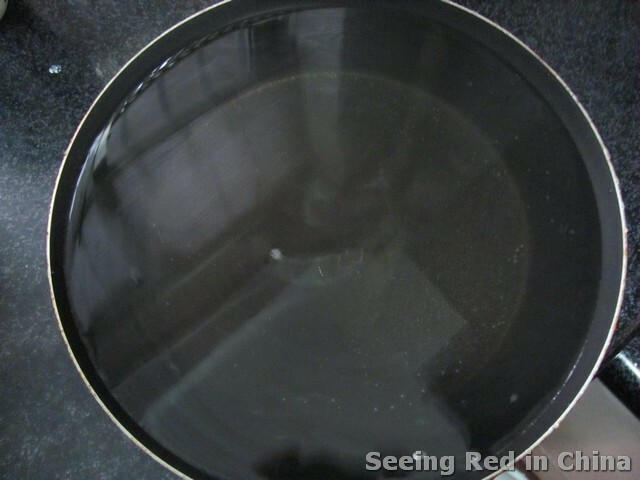 The word “even” shows that there is no difference between the Chinese middle and lower class when it comes to boiling water. I’m aware that there are “minerals” in water, the question is how much and what kind. Since I can’t figure out what kind, the hope was that the “experiment” might encourage others to try and find the answer. If you do the same with a liter of Canadian tap water, I wonder what it looks like. It was also interesting to note that by the time the water boiled about halfway down we needed to turn on the hood to counter the smell. I stay at a western hotel in Beijing that ensures me that they filter the water. I still drink bottled water but I do brush my teeth with tap water. I can sense a slight gasoline smell/taste to the water. I do not doubt the hotel’s assertion of filtering but I do question the efficacy of such filtering and, as Tom points out, the pipes carrying the water may be problematic. The hotel was built in 2006 but given the speed that BJ properties were built with the oncoming Olympics, corners were cut and potentially inferior materials were used. Lead in the pipes? Untreated pvc? etc. The hotel has had to replace and redo many items that should last 25-30 years after only 5-6 years beyond opening. I am not sure even Brita or any of those standard consumer products are completely effective. Better than nothing at all I suppose. Apologies. I guess the sentence needed a rewrite. Tom, you need a Brita pitcher. And you still have to boil your water. Together, you should be fine, I think. I just finished reading a longevity book and the doctors recommend that even in the US you should run bottled water or tap water through a filter. Apparently some American pipes are still around from the Lincoln administration. On a separate note, it’s damn near impossible to say which bottled water people are “trustworthy.” The last several times my water delivery man has come he’s tried to convince me to order more when my old jug is still about 15% full so I’m not “inconvenienced” by running out of water. I’m guessing they try to save some money by re-using it. And if they’re cutting corners there, I don’t want to think about where else they are. Where can we find Brita pitcher in China? I’m living in Senyang right now and I have no idea whatsoever as to where I could find one here. This article has kind of spooked me. I was already boiling tap water and would consistently use it for coffee, tea and cooking, even though I was aware that there probably was other contaminants. Guess I was just hiding my head in the sand, but after 1 year of doing so it’s high time I stopped! Going to switch to bottled water starting from now, thanks a lot for the warning, Tom! Is this news? Even without the graphics. PRC beer is a better bet, but not much good for cleaning teeth and bathing. Tag: The Dept of the Bleeding Obvious. Hi KT. Seeing Red in China isn’t set up as a news site, it’s more of an going guide to life in China. So no it isn’t exactly news, but it is a question that I often hear from new arrivals and thought it might prove interesting to those who were wondering. Also I think too many expats are only focused on the short term health effects that can come from living in a foreign country and don’t realize the other problems that may be more hazardous in the long run – like only worrying about food poisoning while slowly damaging their bodies with gutter oil. Well Tom, set your mind at ease. Having put in a full seven years in China plus a couple in other Asian countries, and being a vegetarian who only drank beer, I successfuly avoided both short and long-term food issues. And I did it without a going guide, since I didn’t own a computer nor did I know about the existence of sites such as yours or even blogs generally. True.